This is a great pick but don't expect it to sound or feel like your typical Dunlop pick. 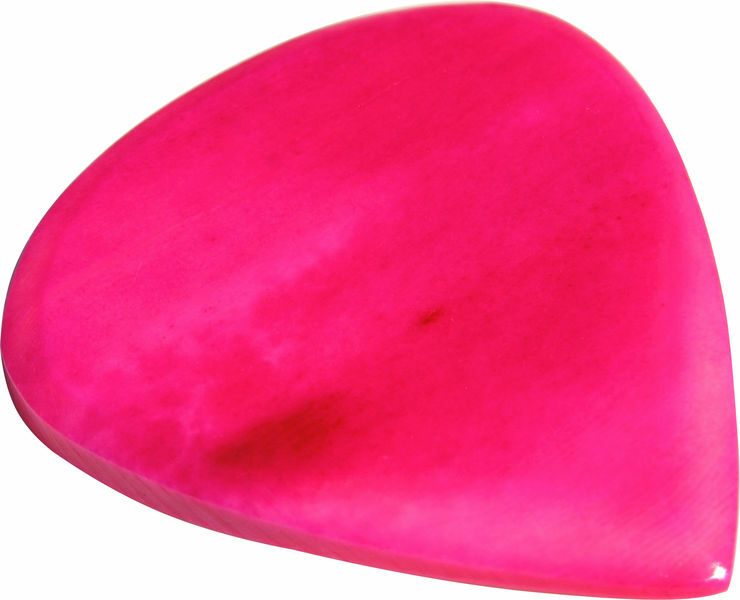 The pick is rather thick and has barely any grip, is anything it's similar in feel to a V-pick. Tonally, I think this pick delivers an interesting character, when digging into the string, it accentuates a lot of highs in an almost glassy like ring. It sounds great on both acoustic and electric. My pick didn't come as bright or deeply coloured like the picture, which is a shame (what girl wouldn't like bright pink pick), however it's a small detail which I can excuse. The pick didn't last as long as I was hoping, however it's made from bone so I can't imagine much can be done to extend the durability of the pick without making a compromise on tone, but it's certainly more durable than your typical plastic/nylon picks. This is the hardest pick I have ever had, I "GUESS" this must be similar to the famous tortoise shell picks Blackmore is/was using (now they are banned). The grip is really good although they are smooth. Only thing is that the colour wears out really fast, although it is not totally unexpected. I have ordered a few more of these, I like this pick A LOT. ID: 316192 © 1996–2019 Thomann GmbH Thomann loves you, because you rock!